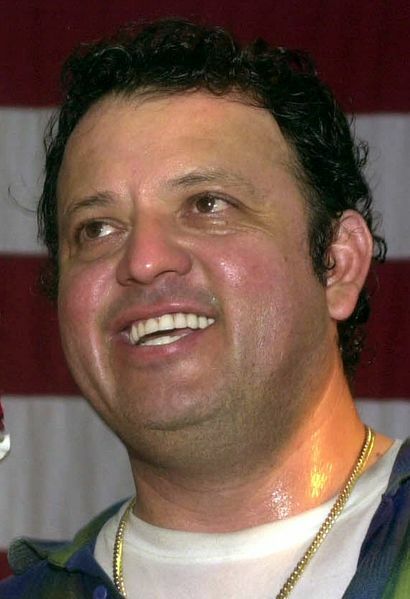 Dennis Gluck, 44, was riding a bus near Ensendada Mexico when Mexican police arrested him on suspicion of chopping his parents (Harry and Jean Gluck) to death in their Chestnut Ave. Carlsbad home on January 18, 2009, according to a story in the San Diego Union-Tribne. Dennis Gluck, 44, was taken into custody by Mexican police Thursday night and handed over to Carlsbad detectives just after 1:30 a.m at the San Ysidro border crossing, Carlsbad police Lt. Kelly Cain said. . . . Gluck was booked into the Vista jail, with bail set at $5 million, Cain said. . . . Castillo said that while Gluck was in Mexico he stayed in cheap motels or slept on the bus and spent his time wandering around. He said Gluck had been homeless before and was used to that kind of transitory life. His circuitous route took him some 2,000 miles, Castillo said. We’re glad he’s off the street, but this continues to be one of Carlsbad’s saddest stories. 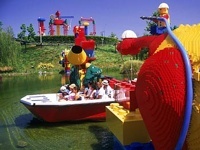 In a feature on why it might be a good idea to vacation a little closer to home titled “Wacky Family Attractions,” Oprah.com is suggesting that people visit Legoland. If you’re a kid at heart, plan a trip to an amusement park inspired by one of America’s all-time favorite toys—the LEGO®! This 128-acre park features 15,000 LEGO models made up of more than 35 million bricks. From a Brontosaurus named Bronte to a tiny rabbit in a magician’s hat, these creations are worth the price of admission. There didn’t seem to be much more to say about Carlsbad’s Bressi Ranch NIMBYs and their attempt to keep developmentally disabled persons from moving into a group home in their neighborhood. But then I read the letter to the editor last week that suggested that, regardless of their legal rights, the new neighbors would be foolish to move into a community where they were not wanted. Sound familiar? That’s the same argument that was once used to discourage persons of the wrong race, ethnicity or religion from moving in next door. Last year County Supervisor Bill Horn defended himself against accusations that he’d engaged in a quid pro quo deal with developers. With imaginations like that, he scoffed, his critics should write novels. Since a novel wouldn’t fit in this space, I wrote him a fairy tale instead. This time it was the unhappy campers of Bressi Ranch that reawakened the bard in me. Once upon a time, in The Land of Troubled Assets, the NIMBYs were nervous in their village by the sea. Having recently immigrated to the edge of the village, they had found homes where they could live among those who looked alike, acted alike and thought alike. Apparently, Latino’s need water, too, and they want it to come from a desalination plant on Carlsbadistan’s Agua Hedionda Lagoon, according to a press release issued today by Poseidon Resources. Leave it to a comedian from LA to tell us what’s best for our lagoon. 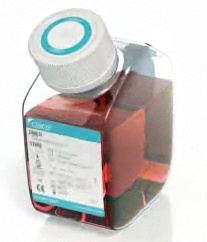 How funny is that? Honda Motorcycles decided to use Carlsbadistan yesterday as the launch spot for the Honda Fury, the company’s first attempt at a “chopper” motorcycle, according to as story on Cyclenews.com. The bike with the longest wheelbase of any Honda ever made (71.24 inches) uses the 1312cc, 52-degree V-twin powerplant found in the VTX range. Why they chose the 1300 over their bigger 1800cc V-twin is something that’s open for discussion and Honda reps told us yesterday it was really down to the fact that the smaller motor lent itself better to the design of the bike. 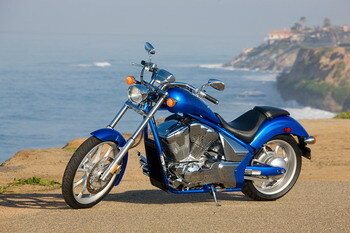 They also said the 1300 offered a better, chopper-like sound with a better pulse because of its single-pin crankshaft. And we didn’t even get invited to try one out. . . anyone see one of these on the road lately? The Oceanhouse Restaurant was the ender for one man during a police chase yesterday afternoon February 24, 2009. Two men suspected of stealing a flat screen TV on Los Robles were spotted on Carlsbad Village Drive and ran when police pulled them over, according to a story in the San Diego Union-Tribune. Police said the 27-year-old burglar got into a blue Ford Explorer driven by a 20-year-old man. Officers spotted the vehicle heading north on Carlsbad Boulevard and eventually pulled the vehicle over in a parking lot on nearby Carlsbad Village Drive where the men ran, police said. . . . One of the men was caught in the Ocean House Restaurant, police said. The second man ran north into southern Oceanside and was arrested on Coast Highway near Morse Street, police said. Techno-savvy health care industry workers are at the Carlsbadistan Sheraton today and tomorrow for the The World Health Care Congress 2nd Annual Leadership Summit on Consumer Connectivity. Kind of funny when we don’t even understand the title of the event. Maybe they can explain it to us? The World Health Care Congress 2nd Annual Leadership Summit on Consumer Connectivity will convene leading health care executives to examine technology as a key enabler of system wide reform. Web-based technologies, including PHRs, physician/patient portals, social networks, and online decision support tools shift the power in health care to consumers and offer solutions to accelerate quality initiatives, increase access and help control escalating costs. This Summit will offer compelling strategies for providers, insurers and employers to revolutionize health care through the integration and adoption of eHealth applications and personal health management tools. Nope, we’ve still go no clue. We will bet that Twenty-20 will be loaded with conventioneers late-night tonight with people who care. . .
Police arrested a 20-year-old man Sunday February 22, 2008 at 9:25 AM in on suspicion of attempted murder in connection with the 18-year-old man who was shot in the head early Saturday morning, according to a story in the San Diego Union-Tribune. Police made an arrest in the case Sunday around 9:25 p.m. during a traffic stop on southbound Intestate 5 near Cannon Road after witnesses identified the shooter, Williams said. . . . He is being held without bail in Vista jail. He also is facing charges of assault with a firearm, participating in a street gang and violating probation, police said. Carlsbad Police, getting it done. 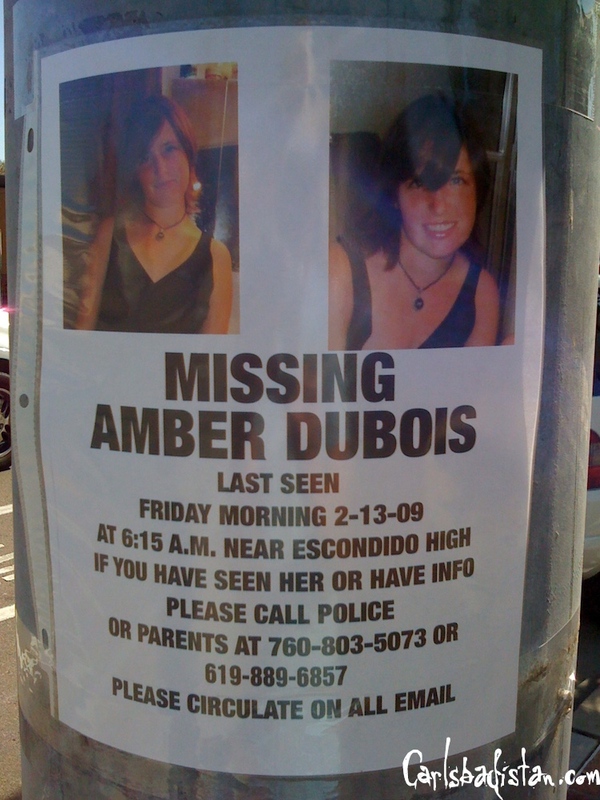 Have You Seen Amber Dubois? 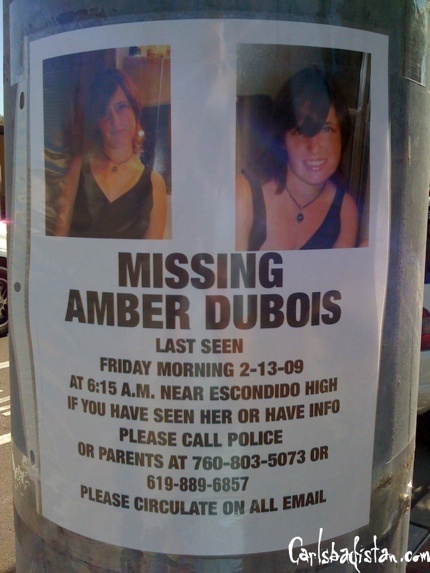 Amber Dubois didn’t come home on February 13, 2009. The 14-year-old girl was last seen at 6:15 AM near Escondido High. These posters were placed near the beach in Carlsbad. Anyone with information should contact Police or her Parents at 760 803-5073 or 619 889-6857.